The GNL License is a copyleft license that gives the end user the freedom to “share and change all versions of a program–to make sure it remains free software for all its users” according to the definition of the GNU Organization.In a Reddit Post, James says Bitmain firmware is “very buggy.” He goes on to say it is essential for people to fix the bugs the Beijing based mining giant introduces in their latest S15 firmware. In high-performance mode, AntMiner S15 has a 28 TH/s hash rate with an energy consumption of 1596 W.Candlestick Arrangements Bitmain is the leading player in ASIC mining. Obviously, this undisclosed weakness is likely to trigger other problems and even affect sales. All the same, BTC prices are steady and likely to reverse losses of the last few days.Notice that our previous BTC/USD trade plans are valid and as long as prices trend above $3,400-500 zone—our immediate support zone, traders stand to profit once prices race above $3,800. That is to say, the level as per our previous iteration is the first minor resistance level. 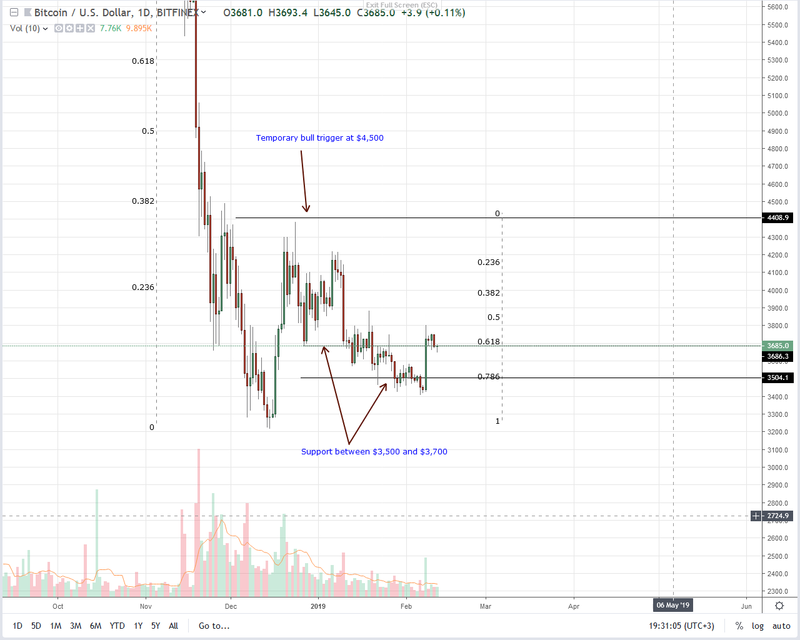 Once prices breach this level, risk off traders can initiate long positions with modest targets at $4,500.From candlestick arrangement, this projection is highly likely to be validated. Firstly, aside from prices reversing from the 78.6 percent Fibonacci retracement level, there is a double bar bull reversal pattern complete with a wide range, high volume bar of Feb 8. Everything else constant, this is very bullish. After a prolonged accumulation from early January, a fitting breakout above this congestion is on the cards.Technical IndicatorsFrom an effort versus result perspective, bulls are in control. The view is even stable thanks to the failure of sellers to extend their reach, reversing gains of Feb 8. A standout, therefore, is the high volumes of Feb 8. Then, volumes were at 32k exceeding those of Jan 28 and Jan 20. But, they were less than those of Jan 10—35k.As aforementioned, we need to see prices break above this congestion and print above $3,800. Accompanying this breakout should be high volumes exceeding today’s averages of 10k and most importantly 32k.